The study of religion represents an essential ingredient of a liberal arts education by encouraging sustained reflection on what it is to be human. In doing so, we seek to combine critical analysis with sympathetic imagination, allowing us to understand more fully not only the ‘data’ of vast, diverse and influential religious traditions, but also the human beings who uphold them. Toward these ends, our field utilizes a tremendous breadth of conceptual tools to foster understanding of religion in all its richness, drawing from anthropology, archeology, history, literature, psychology, philosophy, politics, sociology and theology. Our course offerings reflect an abiding commitment to the study of the traditions that have indelibly shaped our own society, as well as an active engagement with a broad range of the world’s religions that presently constitute our global environment. At Hendrix, students pursue their interests in religion through varied activities including: textual studies, field work, international travel, one-on-one interviews, film studies, artistic projects and service learning. Students of religion think deeply about matters of the utmost concern, including the purpose of life, the nature of reality, and our relationships with others. They develop skills of careful reading and clear writing as they wrestle with these fundamental questions, as well as a greater appreciation of their own assumptions, a respect for others, and a firm basis for constructively contributing to solutions for the problems of our time. 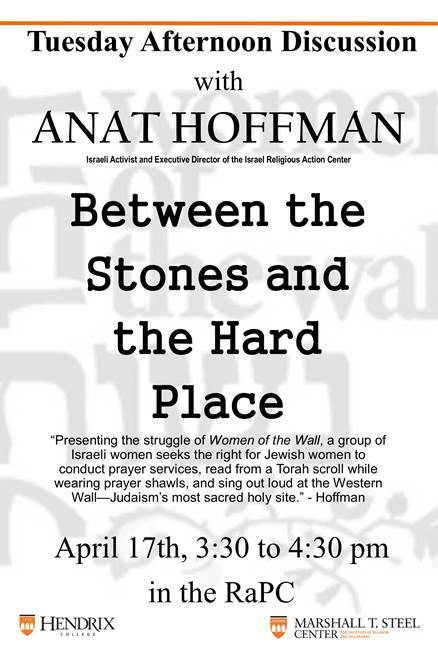 Anat Hoffman, Israeli Activist and Executive Director of the Israel Religious Action Center. While most interfaith resources are concentrated in urban areas, the need to cultivate hospitality toward other religions exists in rural areas as well. During this workshop, we will explore the characteristics of “an interfaith mindset,” learn about existing interfaith initiatives in rural Arkansas, and brainstorm new ways to cultivate interfaith understanding in areas where religious diversity is not readily apparent. All are welcome. The workshop is sponsored by the Greater Arkansas Interfaith Network, with assistance from the Steel Center for the Study of Religion and Philosophy, and facilitated by Dr. Jay McDaniel and the Rev. Teri Daily. With the support of Interfaith Youth Core, Hendrix College will host a one-day regional student interfaith training focused on the potential of interfaith collaboration to transform the American political landscape. The morning keynote will feature Miroslav Volf of Yale Divinity School, who will focus on the value of building interfaith relationships. The afternoon will feature a workshop on building interfaith community and shaping that community for political advocacy, led by the Arkansas Public Policy Panel. Students will have the opportunity to meet and build relationships with students from other campuses. Participating schools include: Hendrix College, Lyon College, University of Central Arkansas, University of the Ozarks and Rhodes College. Tired of patriarchy in the music industry? Same here. 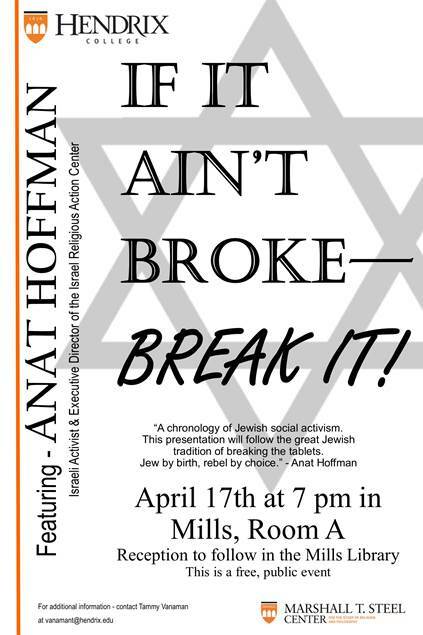 Come and join us as we discuss this topic! Worldview Wednesday- "My Life in Atheism"
Join us for an afternoon with Gwen Stockwell, International Programs at Hendrix College. Click the link to the Events page here. Click the link to the Friday Afternoon Discussion page here.